I hope you will forgive the heretical direction of this blog (as well as its bias towards an English experience! ), but I want to pick up on ‘by what authority are we to follow‘ by considering crises of delegation. These are crises in which people refuse to recognise truths offered by those in authority, forcing new forms of authority to emerge. By considering changes that have been made in the way religious truths are authorised, we construct a rich source of metaphor for the ways in which the listener/follower may constitute performativity. The diagram summarises this metaphor, the numbered balloons corresponding to the points made below. 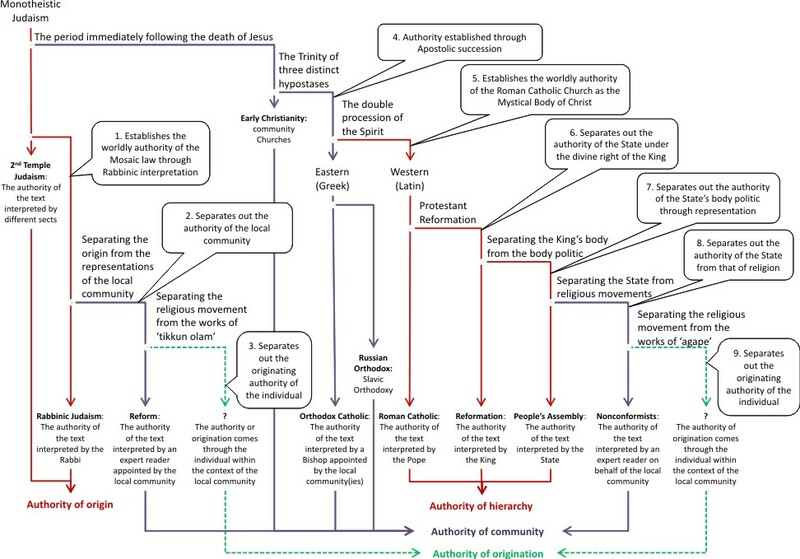 An ‘original’ authority for monotheistic Judaism was recognised in the story of a people’s origin emerging in Second Temple Judaism, the meaning of this authority of origin becoming the Mosaic Law through Rabbinic interpretation (Rabbinic Judaism). Very much later (in the 19th Century), Reform Judaism separated itself from this authority of origin on the basis of a crisis, in which local communities took issue with these received interpretations within the context of their lives together at that time. Authority became vested in the religious community. By the beginning of the 21st Century, the movement of Reform Judaism in the UK is reaching out to people and meeting them ‘where they are’, supporting them ‘thinking for themselves’ and ‘walking their own walk’, but within the context of the movement. Partly a response to the crisis of assimilation, an emphasis on ‘The Jew Within‘ gives authority to the individual’s acts of origination within the context of Tikkun Olam – the work of repairing the world for all humanity. A different authority for monotheism was recognised following the death of Jesus, with the emergence of early Christian communities. The First Council of Nicaea established some agreement concerning the nature of Christ’s Divinity through the doctrine of the Trinity, in which authority was established through Apostolic succession. This enabled the Eastern Orthodox Church to establish its authority through the relation it established between Communion and Otherness, the Russian Orthodox Church emerging subsequently as a slavic translation of this. Authority was based on the religious community. The Roman Catholic Church differed in arguing that the Spirit came through the Son as well as the Father (the doctrine of the Filioque). This enabled an original delegation to a person (St Peter), the meaning of which was interpreted as the Roman Catholic Church being the Body of Christ. This established an authority of hierarchy based on the Roman Catholic Church being ‘directly’ authorised. The first crisis of delegation facing this hierarchy came with the Protestant Reformation in the 16th Century, enabling the kings of states to break with the authority of Rome to establish their own divine right (through the doctrine of the King’s Two Bodies), and their own authority of hierarchy. In England, the next crisis of delegation came in the 17th Century, separating the body politic from the King’s body and establishing the power of the people’s representatives over the State’s authority of hierarchy, further strengthening the break with Rome and the identification between Church and State. And so to the nonconformists who did not accept this identification and placed authority with their own dissenting communities, some of the effects of which are to be seen not least in the emergence of the United States of America! Here religious authority was vested in the religious community in which the Church is separated from the State. In the 21st Century, we see a further step in the refusal of religious authority at the same time as a greater reliance on the individual’s authority for good works, a position evident amongst the Quakers from their beginning, apparent in Peter Ochs’ reading of pragmaticism, but evident also in the emphasis placed even by Pope Benedict XVI on agape. Here again, authority is given to the individual’s acts of origination – the ethical response characterised as the diasporic way. And so we see crises of delegation in two forms of monotheism, each crisis reducing the scale at which ‘the people’ authorise truths until it reaches the individual scale, presenting the individual with an ethical challenge in facing the dilemmas of ignorance. So how does this “rich source of metaphor” bring us closer to understanding performativity in terms of the three asymmetries? An act of origination follows wherever an individual actively holds open all three dilemmas of ignorance, assuming individual responsibility for the ways in which s/he holds them in relation to each other. These three dilemmas are the experiencing of the triple articulation of human being according to a Lacanian reading of Freud’s Project, the individual’s way of binding them together forming the fourth ring of the Lacanian sinthome, corresponding to an identification with a particular form of inscription. This binding together constitutes performativity at the level of the individual. This relation to the triple articulation corresponds to the Eastern Orthodox understanding of the individual’s relation to the Trinity (see for example Michael Grant on this), just as the construction of the sinthome can be read in relation to the Jewish Mystical Tradition. But in both Lacan and Freud, the scale at which a truth is authorised is that of the individual. But the progression in the structures of delegation above show how this identification at the scale of the individual is a relatively recent phenomenon. Thus if we read history backwards (as an après coup), we can see how larger scale institutions have been treated as if they were individual actors constituting performativity in how they support the identifications of individuals. We can read these histories from a psychoanalytic perspective by understanding the institutions as binding together these three asymmetries through the particular way they inscribe themselves in extension. And why should we read history backwards in this way? What might be moving the scale of performativity towards smaller and smaller scales or organisation? To answer this one, we need the next blog on the differences between the simple, the complicated, the complex and the chaotic. An origin is that which an observer identifies as the source of something. In saying “that is the source”, the observer is speaking from a position that is exogenous to the act of sourcing itself. Origination is the process of sourcing itself, and refers to the experience of the individual doing the sourcing – an articulation of experience that is endogenous to the being of the individual engaged in the sourcing. This origination/origin distinction is the endo-exo asymmetry spoken of in the previous blog. The Foucauldian version of this (third) asymmetry is “the retreat and return of the origin”, i.e. in saying anything, there is always that about it which refers back in time, and that which is original to the present moment (written about as the control dilemma in Intent and The Future of Identity and The Dilemmas of Ignorance).